GiftWrap is widely recognized as the leading gift administration system in the planned giving industry. Improve your stewardship and reduce your risk by using GiftWrap to help you with all aspects of planned gift administration. A planned gift establishes a lifetime relationship with the donor, and brings ongoing obligations. GiftWrap’s powerful calculations, reports, payments, and tax functions enable you to meet financial and compliance requirements professionally and reliably. Reduce program risk and enhance overall planned gift administration with GiftWrap. GiftWrap is widely known as the most complete and well-designed planned gift administration software available. Powerful calculation, reporting, and data management capabilities enable organizations to meet stewardship, financial, and state compliance requirements professionally and flawlessly. GiftWrap enables you to easily perform tasks such as calculating liabilities, predicting gift worth, and maintaining CGA market values. GiftWrap’s accuracy and built-in error checking allow you to provide the timely payments and accurate tax forms your donors expect and deserve. And GiftWrap is supported by PG Calc’s highly regarded and knowledgeable customer service staff. Watch this video to learn more about GiftWrap. One of GiftWrap’s core strengths is its sophisticated analytical capability, enabling you to manage your planned giving program with increased confidence. Included among GiftWrap's analytical functions are calculation of FASB liabilities, state reserve amounts, projected remainder amounts, ongoing market values, and overall program statistics. Users that desire a more advanced level of program analysis should learn about GiftWrap’s Advanced Analysis module. PG Calc ensures the highest standards in security controls and procedures by contracting with one of the nation’s top Web hosting providers, Rackspace, who maintains a sophisticated, high-capacity infrastructure with state of the art monitoring, full data encryption, and advanced virus protection for maximum security. GiftWrap’s partitioning of business functions from application administration functions secures your data from unauthorized access. In addition, GiftWrap implements two levels of data encryption, one at the database level, and the second on selected fields like SSN and bank account numbers, to ensure an even higher standard of privacy. GiftWrap 4.0 is a Web-based application, the pages of which are served by an application/Web server and are displayed by a Web browser. GiftWrap 4.0 pages are served over a network, such as the public Internet, or perhaps an internal corporate network. PG Calc makes GiftWrap 4.0 available as a hosted application with pages served securely over the public Internet for those customers who want to relieve themselves of the cost and effort required to run the GiftWrap 4.0 application. GiftWrap 4.0 is also available as an enterprise application for customers who want to manage the application themselves. Whether hosted or enterprise, GiftWrap 4.0 provides the same comprehensive set of planned gift administration tools, calculations and reports. The version of GiftWrap software currently in production on our SaaS platform is version 4.2.15. To verify the verion number of GiftWrap, login to the application from your web browser, and the click on the "My Account" link at the top right of the application screen. To review a complete list of changes made to the current version of GiftWrap, please view the Release Notes by clicking on the "Latest Product Info" link in the top banner of the application screen. The following operating system and browser combinations are supported for operation of GiftWrap and Bequest Manager. * Make sure Compatibility View is set to "on." Each of these modules is described in detail below. The GiftWrap Payment & Tax module allows you to produce 1099-R forms and beneficiary payments by check or electronic fund transfer. 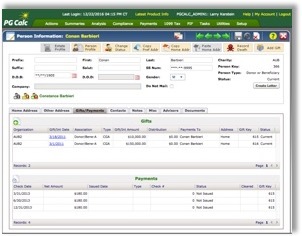 Use GiftWrap 4.0 to produce checks and electronic funds transfers for income beneficiaries. Alternatively, use GiftWrap to create a file of payment information suitable for uploading into another check writing system or general ledger software. This module includes the ability to write final distribution checks to Remainder Beneficiaries for terminated gifts, which is part of support in GiftWrap for Remainder Beneficiaries at the Org level, PIF level, and Designation level. The GiftWrap Pooled Fund Administration Module allows you to perform all of the tasks necessary for complete and efficient administration of charitable pooled income funds, and is designed specifically to address the accounting and processing functions unique to pooled income funds. With this module, you can administer pooled funds with thousands of participants, and the module can be configured to separately administer any number of individual funds. Other functions include unitizing new gifts and allocating year-end tax information. The GiftWrap Advanced Analysis module provides enhanced analysis tools that allow you to project gift remainder amounts, and to provide comprehensive reporting on program trends. The Projected Remainder Amounts report estimates how much each gift included in the report will distribute to your charity and when. The report also displays two present values of these estimated distributions. The Advanced Analysis module also provides a comprehensive view of your planned giving program through a Program Overview and Statistics report. This report is organized by gift type and displays various categories of data. The GiftWrap Workflow module automates both routine and exceptional tasks that comprise your gift administration program workflow. This module is particularly useful for multi-step tasks completed by multiple people, or tasks that require review and approval. The module also includes a reminder and notification system. This module allows you to replace paper and spreadsheets with centralized resource to track task completions, workflow approvals, and client data. The GiftWrap Document Storage module provides you with a centralized, digital repository for all your annuity contracts, trust documents, and other document types. You can associate stored documents with person, gift, organization, PIF, and charity entities. Person information and gift information screens, which provide access to all of your donor and gift information, have document tabs, enabling you to store and retrieve associated documents directly from those screens. In addition, there is a document search and retrieval utility that allows you to review all stored documents and to manage those documents globally. The GiftWrap Enhanced Security module comprises a variety of functions which separately and in the aggregate, enhance the security of the GiftWrap application. While the GiftWrap application incorporates a variety of security features that ensure the integrity and safety of your data, this module provides functions that may be required in order for GiftWrap to conform to third party and internal IT requirements. These functions include Hosting Options, IP Filtering, Enhanced Data Masking, Two-Factor Authentication, and Single Sign On (SSO). Note that Enhanced Security module functions are separately priced, and can be purchased in bundles, or on a stand-alone basis. Q: I’m concerned about the responsibility of administering our planned gifts in-house. How can GiftWrap help? A: GiftWrap can make the complex simple. GiftWrap's advanced functions enable you to successfully maintain your planned gift program. With GiftWrap, you can calculate reserves, maintain market values, and project remainder amounts for all the gifts in your portfolio. In addition, GiftWrap contains many safeguards that help ensure that the data you enter complies with rules for specific gift vehicles. You will also benefit from the depth of experience and expertise of PG Calc staff that are available for client support. It’s the same staff that builds, tests, and uses the application for PG Calc’s gift administration services. There is no gift administration issue we haven’t faced and addressed. Q: How does GiftWrap differ from a fundraising database? A: GiftWrap’s planned gift functionality extends far beyond that of a typical donor database. GiftWrap doesn’t just store data; GiftWrap performs computations crucial to a planned giving program, such as FASB liabilities, gift annuity reserves, and expectancies. Without GiftWrap, reports like these might take days of work with spreadsheets or the services of outside professionals. Q: Is my data secure on Web-based GiftWrap? A: Yes, both during the migration process from previous versions of GiftWrap or another database and on an ongoing basis. We have contracted with Rackspace, one of the nation’s top Web hosting providers. They maintain a sophisticated, high-capacity infrastructure with state of the art monitoring, redundant power, comprehensive physical security, continuous availability, and unparalleled support. Rackspace has full SSAE-16 Type II and SOC 3 certification and works with many major financial institutions. In addition to being hosted in a secure environment, the application has many native security features, including two levels of database encryption and more. Using Microsoft SQL Server Transparent Data Encryption (TDE), the entire GiftWrap database is encrypted. In addition, selected fields, including social security numbers and dates of birth, are encrypted a second time, to further ensure data privacy and integrity. GiftWrap supports both user and role based access control. The resulting two-level access control model allows you to create authorized users whose access to the application and to your data is strictly limited by you. Role and user based access allows you the flexibility to create an access control model that conforms to your workflow and operating policies. Add to that a robust audit trail accessible only to the administrator. Download the GiftWrap Security FAQ document to learn more about the security safeguards that PG Calc has implemented to protect your data. Q: How is the performance of GiftWrap? A: GiftWrap performance is great! GiftWrap was designed and built to provide users with an experience similar to the desktop version of the application. In most instances, GiftWrap performance equals that of the desktop application, while in some instances, including CashTrac, FASB and 1099 Tax Summary reports, GiftWrap performance is better. When running in a hosted environment over the Internet, GiftWrap user interface performance will be similar to that of the desktop application. In some instances, most notably when GiftWrap has to “post back” to the server to obtain and display data, GiftWrap performance is somewhat slower than that of the desktop application, as measured in seconds. We have made every effort possible to minimize the instances in which GiftWrap has to post back to the server. When running over a corporate WAN, GiftWrap performance will consistently equal or exceed that of the desktop application if recommended server and network configurations are in place. Sign Up For Your FREE GiftWrap Trial Now! Sign up for your free trial, and get hands-on experience with GiftWrap, the industry leading planned gift administration system. You will have access to all GiftWrap functions and your trial account will be pre-populated with sample data. Each trial account comes with a copy of the GiftWrap Introduction Guide, which walks you through a step-by-step tour of all GiftWrap functions. Complete and submit the trial request form, and begin your evaluation of GiftWrap today! ...to keep an accurate tally of gifts and for reporting purposes. GiftWrap gives us one accurate source rather than the three to four different and varying spreadsheets, plus individual files, I’ve had to dig through to assemble and enter everything. In short, planned giving record keeping was all over the board before GiftWrap!”"
Let us take away the headaches and hassles of administering your planned giving program now. Staying compliant is time consuming and complex; we provide FASB and State Reserve Reports. Managing the complexities of gift administration. With state-of-the-art tools and the most experienced administration staff in the industry, we can help you improve your stewardship and ensure your program is operating in an optimal fashion. We can help!